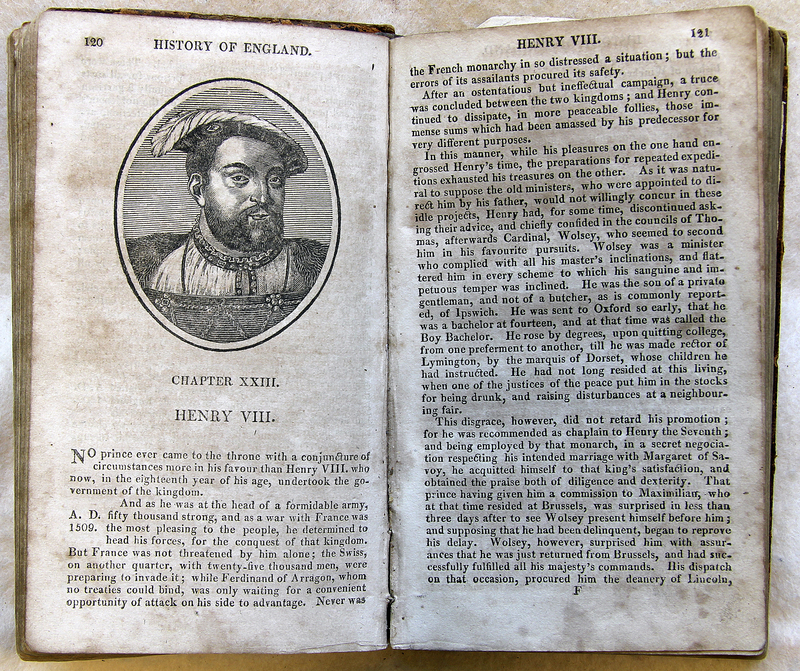 King Henry VIII (1491-1547) ruled England for 36 years. His controversial personal life (six wives and many mistresses) led him to break with the Catholic Church to create the Church of England. At first Henry supported the Papacy. In July 1521, he wrote An Assertion of the Seven Sacraments against Martin Luther, which was itself a response to Luther’s Babylonian Captivity (1520), which had denounced the Papal system. A slanging match began: Henry called Luther a ‘serpent so poisonous’ and ‘a limb of Satan!’, while in his own rebuttal (Adversus Henricum Anglicum), Luther called Henry ‘that king of lies, King Heinz’ and a ‘damnable and rotten worm’. Henry’s work was dedicated to Pope Leo, who, pleased with Henry’s support, gave him the official title of Fidei Defensor (Defender of the Faith). This 19th century copy of Goldsmith’s History of England contains some delightful wood engravings by Thomas Bewick. Oliver Goldsmith, “An Abridgment of the History of England,” ourheritage.ac.nz | OUR Heritage, accessed April 24, 2019, http://ourheritage.ac.nz/items/show/10366.